Posted by Brendan Samuels on January 30, 2018 in Hockey, Sports, Top Dawg. 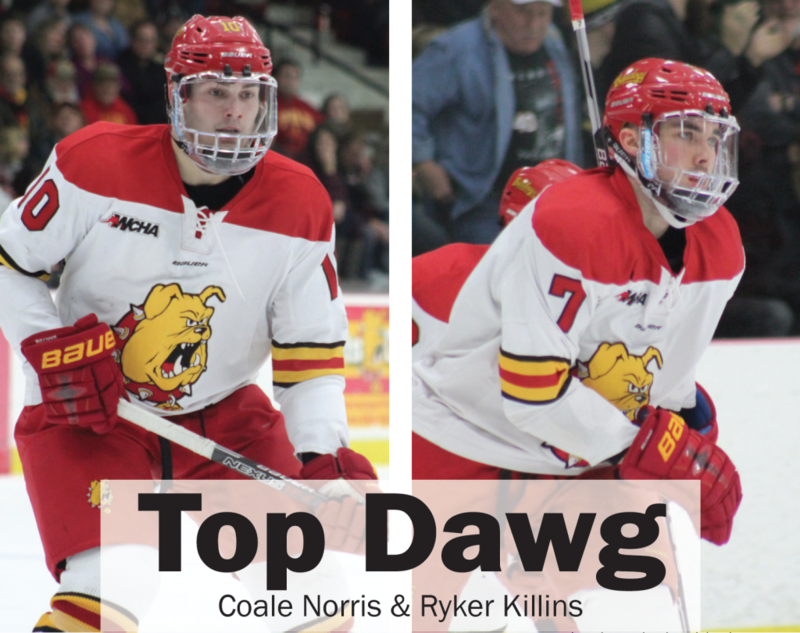 A big weekend for Ferris hockey lands the team not one but two Top Dawg recipients. The Bulldogs entered play against the Michigan Tech. Huskies in search of a sweep to improve their ranking in the WCHA. Impressive play from freshman forward Coale Norris and junior defenseman Ryker Killins helped them do just that. The Friday, Jan. 26, matchup saw plenty of scoring with the Dawgs coming out on top by a score of 4-3. Killins owned the night, stuffing the stat sheet with two power-play goals in the second period and adding an assist as well. Norris had a power-play goal of his own in the second period and assisted on one of Killins’ twine-ticklers. Norris rolled his play over into Saturday, Jan. 27, for a 3-1 victory. The freshman netted his seventh career goal in the second period on a nice assist from Killins to complete the sweep. The Dawgs exit the weekend with a 12-17-1 overall record and a conference record of 9-12-1. With the back-to-back victories, Ferris jumps two teams—Alabama-Huntsville and Alaska—to land sixth in WCHA standings. With just six games remaining on the season, the Bulldogs will be looking to propel themselves into the post-season. Ferris will be back in action at 11:07 p.m. Friday, Feb. 2, when they take travel to Fairbanks, Alaska to take on the University of Alaska-Fairbanks Nanooks. Click here to find out who took home last week’s Top Dawg honors for his efforts on the basketball court.